Dreams of Empire, an expansion set for our Soldier Emperor and Indian Empires games, links the two together with a map of Central Asia and additional pieces for mid-sized power Persia and small powers Kokand, Khiva and Bokhara. That adds a lot of fun to the two games, but I’ve decided to turn the expansion set into a full, playable boxed game – since I’m both designer and publisher, I can do this. In addition to the Central Asia map, we’ll also have a full-sized East Asia map, a set of playing cards, and additional pieces for Burma, Siam, Viet Nam and the Chinese Empire, all playable as major powers. It still serves as an expansion for its sister games, and a connection between them. But now, there’s more. While war rolled across the Indian subcontinent during the years covered by Indian Empires (1767-1820), South-East Asia saw continual conflict as well. Burma re-unified in the 1750’s into the Third Burmese Empire and, with a large and aggressive war machine, engaged in a series of wars with Siam between 1759 and 1812. Concerned over Burmese expansion, the Chinese Q’ing Empire launched a massive invasion in 1765 that ultimately failed with astronomical losses. 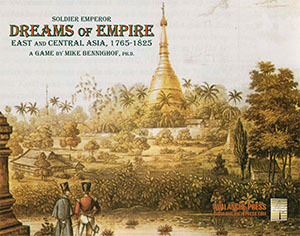 Balked by the Siamese in 1812, Burma turned to the west and invaded Assam in India in 1816, defeating the locals but coming into conflict with the British East India Company. The British invaded in 1824, leading to a destructive war that cost more lives and cash than any previous war waged by Britain and The Company in India. 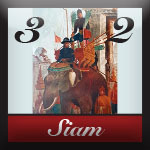 When not fighting the Burmese (and sometimes while fighting them), Siam engaged in a series of wars with Viet Nam’s Tay Son Dynasty, fought over the weak Khmer Empire that served as a buffer state between them. The Vietnamese also fended off a massive Chinese invasion in 1788, but in 1802 the Nguyen clan overthrew the Tay Son in a bloody civil war. Looming over these three warring states and their unfortunate Khmer, Lao and Malay neighbors is Q’ing China. This is the era of Chinese history noted for the Ten Great Campaigns: wars of conquest waged against the Dzunghar peoples of Central Asia, Nepal, Burma, Vietnam and Taiwan. The Qianlong Emperor fancied himself a great conqueror (though never taking the field personally) and even wrote his own history of the campaigns, in which his forces won every battle and campaign (that’s not how it actually happened, but he wouldn’t be the last world leader to re-shape reality to his own liking). I’ve long wanted to re-create these campaigns in our Gunpowder Strategy series; we ran a proposal by the Gold Club a while back and it crashed spectacularly. 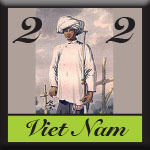 To try to sell Burma-v.-Siam in the gunpowder era as a stand-alone game would be a fool’s errand topping any we’ve pursued before (and we published Airlines2!). Dreams of Empire now serves both as a stand-alone game and as an expansion set for its sister games. As a separate game, there are two to four players and a wealth of scenarios (it wouldn’t be an Avalanche Press game without a wealth of scenarios). Burma is aggressive and strong, at least until it runs into the British; Siam must play the balance of power with aggressive regimes on either flank but thankfully no direct border with China. Viet Nam is likewise aggressive, but lacks the power and geographic cohesion of Burma, while China is more powerful than all of them. 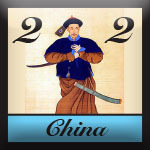 The game makes it clear why the colonial powers needed steam power and opium to bring down the Q’ing; China may lack the most modern weaponry and tactics but can field and supply enormous armies. The South-East Asia scenarios are fun, but the game really takes off when it’s combined with Indian Empires. The Indian kingdoms won’t have a lot of impact on those of Indochina, but the Burmese have an interest in the sub-continent. The real change comes with the much broader strategic opportunities offered the colonial powers of Britain and France. The French in particular had a keen interest in the region; during the American War the local French commanders, Admiral Pierre André de Suffren and Charles Castelnau de Bussy, tried to convince the royal government to abandon its interests in South India for more fruitful possibilities in Burma and Siam. De Bussy attempted a commercial treaty with Burma in 1783, but failed to reach an agreement; the British did the same in 1794 with the same result. All three games are brought together for the grand combined campaign, with action stretching from Galway to Guangdong. The colonial powers now have interests to defend (or expand) across half of the globe, while players limited to Europe, like those in charge of Austria or Prussia, get to play with exotic kingdoms like Mysore or Siam at the same time. The Central Asian map provides a land bridge between Europe (actually, the Middle East) and India, with a new power (Persia) sitting astride the route. Persia isn’t all that powerful, but can muster enough strength to keep the Ottomans from ignoring their eastern flank – the Persians had besieged Baghdad in 1743, and held Basra as recently as 1779. The Russians now have overland access to India as well, by way of Central Asia. It’s a much tougher trek than the crowned heads of Europe believed at the time, but it is possible for Russian armies to enter the Great Game on foot. It’s a new front for the Russian player to consider, one allowing expansion but unlikely to pose a threat – the Afghans aren’t going to march on Moscow. The combined game is pretty large: one double-sized map (Europe), one full-sized (East Asia), one mid-sized (South Asia) and one small (Central Asia). But since Soldier Emperor is an area-movement game, with provinces and sea areas linked by land and sea routes, the maps don’t have to be physically adjacent to one another in play – you can put each on its own table if you want, leaving plenty of room to move around them and play. It’s been a fun project. I’d sketched out an Indochina game some years back, but knew we could never sell it; I went through a depression-fueled period of designing games that couldn’t be sold. Later, I decided that we could salvage the work as a Gold Club special download. Adding it to Dreams of Empire allows me to indulge that desire to study the kingdoms of South-East Asia and to greatly upgrade the product at the same time. The download version did not include Q’ing China except as an off-map event, and hadn’t been conceived as an extension of Indian Empires (which wasn’t in print at the time). Added to Dreams of Empire, the package becomes far more attractive while retaining all of its utility as an expansion set. Eventually, of course, we’ll go to the Americas and round out the world of Soldier Emperor as a truly global event. But that’s for the future. Don’t miss your opportunity to put Dreams of Empire on your game table! Join the Gold Club and find out how to get the sweetest deal on it.